Since discovering The Goddess Revolution by Mel Wells, I’ve realised just how important it is to find the time for yourself, to practise self love regularly. If we don’t take care of ourselves, we aren’t the best version of ourselves and other areas of our lives suffer for it. Mel’s book resonated with me on almost every single page. A lot of the book is about your relationship with food and exercise, but it’s also about loving yourself and caring for yourself, and that it’s totally ok to spoil yourself. So I’m no longer going to feel bad about the highlights I have 3-4 times a year, or the occasional splurge in Boots, because I’m not just a mum, I’m also a woman, a woman who has very low self esteem and who deserves to feel good about herself, in whatever way possible. 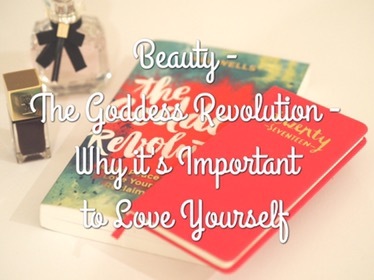 For anyone who has yet to discover The Goddess Revolution, I would definitely recommend giving it a read. It’s a brilliant book and has totally changed the way I feel about diets and food in general. Total game changer! Love this! We are more than just mums, and sometimes it is hard to remember that. I have to admit that I’m not one to wear make up every day, or have my hair done regularly etc but I do love a bubble bath (on my own!) and time out to read a book or do some writing which all counts as me time! It definitely helps me focus more and means when I am at home with Alfie I can concentrate on being with him and not be distracted. Why do people judge so much as well – well done you for standing up and admitting that there’s nothing wrong with doing something that makes you feel good about yourself! I’ve been looking for a new read and this is something that I’ve been wanting to divulge into.